Yes, that really is cloud under the deck of the Millau Road Bridge. 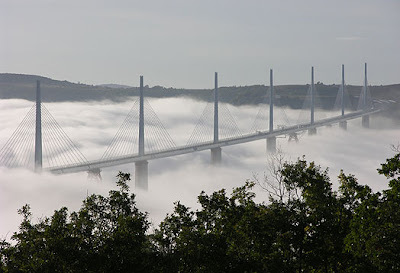 It is not the tallest bridge in the world, but it is the tallest vehicular bridge, the deck being 803 feet above ground at the second pylon beyond Clermont-Ferrand. It cuts around 61kms off the journey between Clermont-Ferrand and Pézenas, and saves awful congestion in the small town of Millau, all three French towns being en route to the French Riviera and Spain, popular with Parisiens and the Brits during July-August. Not quite as tall now, but I still don't feel even slightly envious. 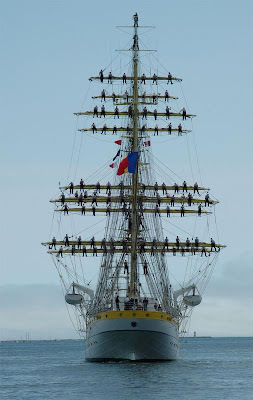 This is a shot taken looking for'ard of the Tall Ship 'Europa' while she was visiting the Halifax Tall Ship festival, 2007. The crew are demonstrating where not to be in a storm, actually readying to drop sails. The lucky ones get to pull anchor! The sight is incredible, but one has to remember that sailing like this was not for the faint hearted, and many sailors would have been 'press ganged' into service. The 'Press Gang' would frequent drinking houses, selecting only the fittest of drunks for 'signing on the line'.